Spring is upon us, and as the top starts to come down on the car more and more to enjoy the beautiful spring days, the urge to go faster is also stirring. Our first performance upgrade of the season was to swap out the stock exhaust. We looked around a while for one that looked good and would provide a modest performance increase without becoming too loud. The one that caught our eye was the HKg Twin Sport Exhaust that Andy is selling at Brainstorm. The glistening dual tips coming from under the bumper struck our fancy, and after talking to Andy, we decided to make the swap. The HKg has a 2 1/4 inch diameter pipe from the catalytic converter to the muffler, and a pair of 2 inch diameter pipes from the muffler to a pair of 3 inch diameter polished tips (compared to the stock exhaust which sports about 1 7/8 inch diameter pipe throughout). We expected the larger diameter pipe to provide reduced resistance to exhaust flow and allow our engine to breathe easier and produce more power. Norm Garrett wrote an article in the national magazine (98-1 edition) describing the basics of a cat-back swap, so I will not repeat the information he provided, but will focus instead on the special stuff for the HKg. 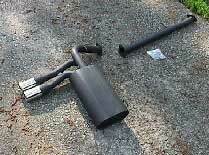 The HKg comes in two parts: the muffler and a short pipe to attach the muffler to the catalytic converter (see picture). The split makes it much easier to snake the exhaust up under the car where it goes. The tips come out through a cutout in the rear bumper, so you will need to remove the bumper cover to make a clean cut in the cover, and a cut in the heavier plastic bumper behind the cover. Removing the bumper cover requires the removal of the license plate, tail lights and the rear molding and garnish (hey, that's what the manual calls it!) ­ and while you're at it, pull the old exhaust out, too. This requires the patience to remove about50 fasteners and most of the rear end of your car! The cut in the bumper cover is done using a cut-out pattern supplied with the exhaust. We traced the pattern and made the cut with a coping saw, though a Dremel tool or a sharp Exact-o knife should do as well. Beware of whimpering sounds coming from the car owner while making permanent modifications to their car! We sanded the cut with 60 grit paper, then taped it off and sprayed the edge black to match the car (see picture). The actual bumper has a thin cutout area that we cut with a sawzall. Once the holes were cut, we put the HKg in and put the rear end of the car together. It should be noted that our 1992 has an "extra" exhaust hanger just behind the catalytic converter that Mazda decided was not necessary on some of the later models. The HKg is designed without a hook for this hanger, and caused some questions for us when we couldn't find one! We initially noticed that the tips were not well centered. I tried to bend the hangers, but suffered from a common ailment know as not-a-big-enough-wrench-itis, which was complicated by not-enough-room-to-maneuver illness. A quick visit to Brainstorm, where Andy popped the car up on his lift and showed us a trick, solved the centering problem. He slipped a piece of fuel line over one of the hangers and tightened it in place with a hose clamp such that it pushed the exhaust over into the center. The hole in the bumper cover for the old exhaust is still there and needs to be dealt with. Brainstorm is working on a snap in piece that you can paint the color of your car, but has not found a reliable supplier yet. However, for our black car the old hole is hardly noticeable, especially with the dual chromed tips of the new exhaust drawing your attention to the center of the bumper. So, do we like it? You bet! We have had several people comment on the looks, as well as the great sound. The exhaust is tuned to have a great rumble at around 1500 RPM. So I now find myself waiting at lights, tapping the accelerator to bring the engine up through the "sweet spot" at 1500, and enjoy the sound. However, at higher RPMs, the exhaust is not boomy or louder than stock, so we can still talk in the car on the freeway. We have noticed a considerable increase in power through the whole RPM range after installing the HKg, and look forward to getting our car on the dyno at Poconos. Next month, we will look at installing an exhaust header to complete the path for the exhaust from the engine back through the tailpipe. Next month we will also learn a valuable lesson about not doing serious work on your car the night before a club event! Until then, happy motoring!